A highly competent killer capable of getting the job done and on occasion an exceedingly lucky opportunist in the right place, very little is known about the henchman dubbed, The Skull, a calm and collected assassin who manages to eventually down the infamous Tony Montana who seemed to be unstoppable prior to The Skull’s introduction. Working for Montana’s rival crime boss, Alejandro Sosa, The Skull’s real identity and background are never provided, leaving him as an ominous shotgun-wielding individual dedicated to killing. It is suggested that he received his nickname due to his gaunt skeletal face and thick, circular sunglasses, perceptibly giving him the appearance of a human skull. With no spoken lines, The Skull acts on behalf of the Bolivian Cartel, and is responsible for executing Omar Suarez by throwing him out of Sosa’s helicopter, hanging him in the process. And upon the assault on Tony Montana’s mansion, The Skull effortlessly kills Montana’s loyal associate Nick the Pig with his trademark sawed-off shotgun, eventually leading to The Skull also dispatching of the film’s lead himself by shooting him in the back. 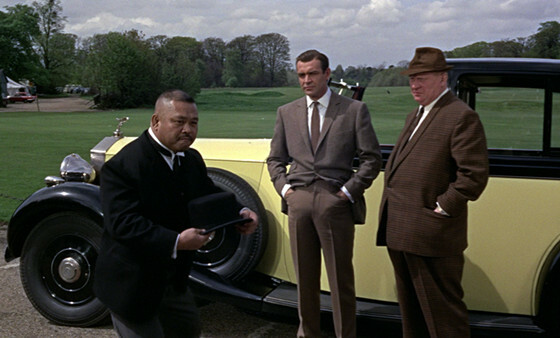 A chauffeur, bodyguard, golf caddy and deadly assassin to the titular Auric Goldfinger, the almost entirely silent henchman OddJob depicted by Japanese-American actor, weight-lifter and professional wrestler Toshiyuki ‘Harold’ Sakata, is not only involved in “Goldfinger” which is arguably the best James Bond film ever made, but is also widely considered as one of the franchises finest villainous creations to date. Mostly limited to making grunting noises and smiling menacingly, OddJob wears a Sandringham hat with an absurdly sharpened steel rim, which he utilises as a stylish yet highly deadly guillotine Frisbee, most notably giving it a practice throw to depict to audiences its robustness and lethal ability, taking the head of a stone statue clean off. A typical brawn over brains entity, OddJob is willing to sacrifice his life in the name of his antagonist employee’s evil plan, in turn, the loyal henchman remains close to an active bomb inside of Fort Knox, Kentucky, in an attempt to stop anyone, most notably James Bond, from disarming it. His towering size, shear power and intimidating body mass, much like all the best henchman, leaves the film’s protagonist outmatched and overpowered, requiring expert levels of ingenuity and resourcefulness to overcome their foe. The German Karl Vreski is an irate revenge-driven terrorist turned professional thief, out for payback after the Nakatomi Tower vigilante cop John McClane kills his younger brother, Tony. Working for Alan Rickman’s iconic villain Hans Gruber, the ground-breaking action masterpiece “Die Hard” shows the pair of troublesome siblings, along with an army of other garish terrorists take over the renowned tower on Christmas Eve as a convoluted heist to steal gold, with only Bruce Willis’ off-duty cop John McClane prepared to try and save the day. Whilst Rickman’s charmingly malevolent Gruber is one of the finest villainous creations of all time, he has a host of remarkable henchmen at his side. Karl Vreski was a calm and exceedingly professional yet merciless killer prior to his brother’s untimely death. However, upon swearing vengeance after discovering Tony’s demise, the infatuated Karl becomes a detached psychopath, forgetting his orders, uncontrollably reckless and ruthlessly violent, obsessed with hunting down McClane in the name of remuneration. Henchmen with personally motivated intentions acting out of revenge generally make for highly formidable foes, and Karl Vreski is undoubtedly one of the most faultless secondary villains of this nature. Hell-bent on retaliation, he takes some serious putting down, and later seamlessly comes back from the dead to have one last pop at McClane, thoughtlessly costing him his life in the process. An infamous actor who now makes a steady income providing voice work for computer game characters and guest starring in an endless host of low budget horror films, the notorious Vernon Wells is arguably best known for portraying the villainous Bennet in the Arnie quote-fest “Commando”, however, a few years prior to that role, he undertook the supporting character of the vicious lunatic Wez in director George Miller’s second outing in post-apocalyptic Australia “Mad Max 2: The Road Warrior”. More than happily content with the horrific post-apocalyptic carnage that consistency exists around him, the disconcertingly psychotic Wez is the unnerving and obliging first lieutenant of the pieces big bad – Lord Hummungus, the alarmingly disfigured ruler of the sand-filled wasteland of Australia. The crazy-eyed Wez is undoubtedly one of the most bizarre, intimidating and maniacal creations thought up by the team behind the Mad Max franchise. Portrayed as a crazed Vietnam Military veteran as outlined in interviews by Wells, Wez is entirely committed to the abrasive madness that surrounds him, as well as his faultless dedication to any job put in front of him. The competent and stanch Wez makes for a perfect henchman to be allied with, even if it is often suggested that his dubious loyalties to Hummungus’ Marauders may waver should the opportunity to start a mutiny come into fruition. Combining endless endurance, mesmerising speed, and prodigiously powerful fighting techniques, it is unquestionable that the dexterous Yayan Ruhian is one of the most visually absorbing martial artists in cinema right now. Appearing in Gareth Evans “The Raid” as the dreaded Mad Dog, Ruhian is the right hand man to the merciless tower block tyrant Tama. Using a combat style called Pencak Silat; the deadly yet disciplined Yayan Ruhian is a former martial arts instructor, as well as a former operative for the Indonesian Presidential Security Forces, an outfit equivalent to the United States Secret Services. He received his first acting role on Gareth Evans second picture “Merantau”, originally employed as a specialist choreographer; he decided to audition for the supporting role of Eric, successfully landing the part. Since working with the Welsh director, the hypnotically agile Yayan Ruhian has appeared in the two “The Raid” entries. A brutal and unstoppable killer, Mad Dog is a highly feared advocate of the Indonesian police force’s primary target Tama, infamously known amongst the ranks of officers who discuss his swift and deadly ability on the way to their tower block destination. Mad Dog is responsible for two of the unsurpassed set-pieces within “The Raid”, first up going toe to toe with Sergeant Jaka, and later competently taking on both Rama and Andi in a flawlessly choreographed two verses one death match. Yayan Ruhian proved to be such an adored performer within the piece, he was later recalled to play another character in “The Raid 2: Berandal”. A devoted friend and endlessly loyal enforcer to Mafia boss Don Vito Corleone, the notorious Luca Brasi had an infamous reputation as a decidedly feared criminal and a brutally savage killer in Mario Puzo’s seminal novel “The Godfather” as well as in pivotal director Francis Ford Coppola’s influential cinematic adaption of the same name. Often operating as a lone wolf to avoid implications against him, the careful and vigilant Luca Brasi was a highly-skilled, competent henchman, eliminating anyone unfortunate enough to be fingered by Vito Corleone, including significant witnesses and rivals of the Sicilian Mob boss. Allegedly based on real-life criminal enforcer Willie Moretti, he was a strong and silent type with an imposing stature, born into an Italian family in Rhode Island, he had a violent and chequered history due to an abusive father, who frequently beat both him and his mother. His father would later become his first victim ahead of his transformation into a sadistic, yet extremely professional killer. Portrayed by Lenny Montana who in true henchman fashion was previously an ex-wrestler; however, his most intriguing history prior to becoming a professional actor was his real-life involvement with the Colombo crime family, in which he acted as an enforcer, bodyguard and arsonist. Eventually serving a prison sentence at Riker Island for the family, upon his release he took up acting as an escape from a further life of crime. 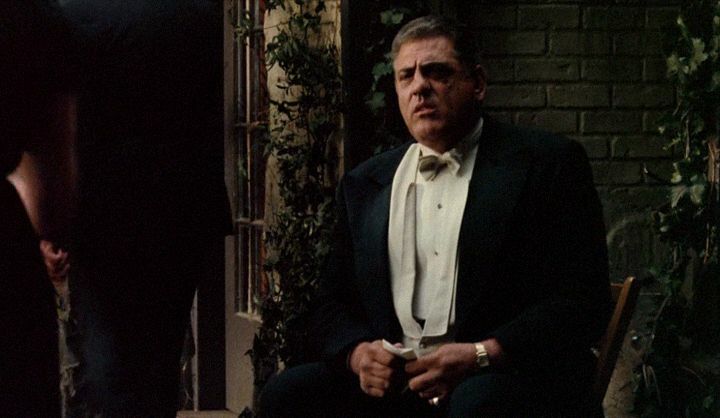 No doubt Lenny Montana effectively used his factual hench’ing as a textbook guide when he was cast in “The Godfather”. Unquestionably standing as one of the most recognisable and unnerving antagonists of all time, what the terrifying looking Jaws fundamentally achieved as a formidable henchman in the James Bond universe was being infinitely more intriguing and compelling in comparison to the predominant villainous bosses in which he served under. Appearing in more than one of the substantial franchises films, it is not very often that a supporting henchman manages to outshine the main villain quite as impressively as Kiel’s Jaws so faultlessly accomplished. 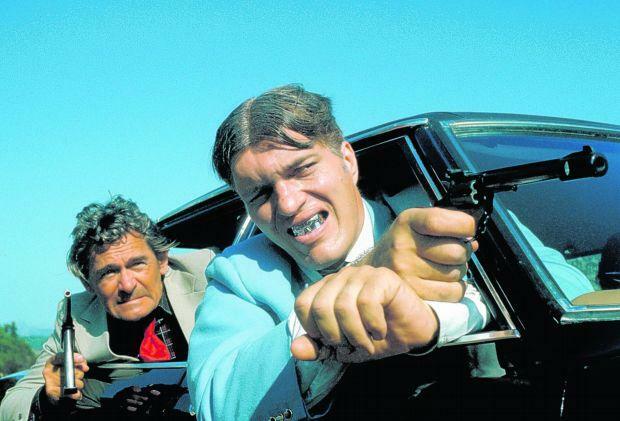 Portrayed by the legendary actor Richard Kiel, a huge, bulk of a man who suffered with gigantism, the metal-mouthed juggernaut first appeared in “The Spy Who Loved Me” alongside the chief antagonist, megalomaniac Karl Stromberg, before reprising the role and reappearing in “Moonraker” a mere two years later, this time working for millionaire sociopath Hugo Drax. An unstoppable force whose massive 7-foot structure and unsettling ability to chew through practically anything with his metal gnashers made Jaws instantly distinguishable as well as being a terrifying opponent of the saga’s hero. Unsusceptible to a number of offensive approaches often meant the severely outmatched James Bond had to come up with ingeniously inventive ways to stay out of his deadly grasps. A slight adaption of another steel-toothed character appropriately named Horror from Ian Fleming’s original novel of the same name, Jaws was immediately loved by audiences during test screenings, in turn, altering the treasured henchman’s initial fate of death by sharks, allowing him to survive “The Spy Who Loved Me” and return to wreak further havoc on the spy, 007 in “Moonraker”. A supporting actor, prolific stuntman and skilled martial artist, trained in Kung Fu, Tae Kwon Do, Kali and Jujutsu, to name a few of his back catalogue of combat styles, the instantly recognisable moustached Al Leong has been in the background of several action films, more often than not, operating as a henchman for a big bad, subsequently leading in his on screen death on most occasions. Leong has been countlessly shot, strangled, blown up and sliced into pieces over decade’s worth of films, more than justifying his available to watch death reels on YouTube. Author Bio: Dan Carmody, born and raised in Doncaster, England. When not working as a Civil Engineer, his one true passion is cinema, relating back to the early 1990’s when his mum showed him a lot of horror films way before he should have been allowed. He is an avid follower of all film genres, most notably the work of Tarantino, Fincher and The Coens. Also enthusiastic about video games, travelling, making lists and cheese.